The Lake Killarney Home Owners Association was incorporated March 15, 1962, and is the sole owner of the “Common Properties” known as Lake Killarney (the lake itself), it’s two beaches, parkland areas, along with various sections of property surrounding the lake. Lake Killarney is a subdivision surrounding a private lake located near the Fox River in unincorporated Cary, Illinois, Algonquin Township. It is located 45 miles northwest of Chicago. Residents have lake rights to an 80 acre glacial lake with a maximum depth of 24 feet, an average of 10 feet, and a storage capacity of 345 acre-feet. 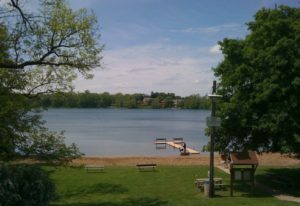 Lake Killarney serves as a private recreational lake with access limited to organization members only. The lake is stocked yearly in the fall with Walleye, Large Mouth Bass, Small Mouth Bass, and Northern Pike. Residents practice catch and release to assure the fish stay plentiful. A valid Illinois fishing license is required with the Illinois Department of Natural Resources performing regular visits to ensure legal fishing is being conducted. Swimming, fishing, row-boating, canoeing, and sail-boating are the major uses of the lake. Regular water samples are taken from the lake to ensure that the lake is clean and swimmable. No fossil fuel motors of any kind are allowed on the lake. Lake Killarney residents enjoy several annual events. We have Christmas tree burn in January, an Easter Egg Hunt at Easter time, an annual neighborhood garage sale during the Spring, a pig roast and fishing contest in August and a new tradition of a Fall Festival. Residents participate in beach cleanup for East and West beach in May. Board meetings are held each month on the 1st Tuesdays and there are two general membership meetings each year in May and November to approve the budget, amend changes to the By-Laws and elect new board members.